Location: Hotel Shterev in Sopot is located in the center of the town. 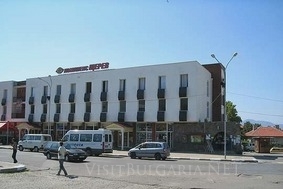 The complex is situated in close proximity to the house museum and the monument of Ivan Vazov. Accommodation: Shterev Hotel in Sopot offers 31 double rooms, 3 bedrooms, and 6 studios. Each room offers individual bathroom, TV, air-conditioner. The hotel also offers a free parking area. Wine and Dine: The hotel disposes of a 60-seat restaurant and a cafe.